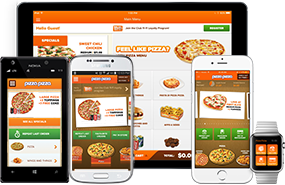 Toronto, Ontario, November 6, 2018 – Pizza Pizza Royalty Corp. (the “Company”), which owns the Pizza Pizza and Pizza 73 Rights and Marks, released financial results today for the three and nine months ended September 30, 2018. For the three months ended September 30, 2018 (“Quarter”), System Sales from the 758 restaurants in the Royalty Pool decreased 0.4% to $138.5 million from $139.0 million in the prior year comparable quarter when there were 751 restaurants in the Royalty Pool. For the nine month period ended September 30, 2018, Royalty Pool System Sales decreased 0.6% to $404.9 million from $407.4 million in the same period last year. Total Royalty Pool System Sales for the three and nine month periods decreased over the comparative periods as a result of the reported decrease in same store sales growth (“SSSG”), offset by the impact of new restaurants added to the Royalty Pool on January 1, 2018. SSSG, the key driver of yield growth for shareholders of the Company, decreased by 0.8% for the Quarter compared to the same quarter last year. Year-to-date, SSSG decreased by 1.4% compared to the same period in 2017. SSSG is driven by the change in the customer check and customer traffic, both of which are affected by changes in pricing and sales mix. During the third quarter, the average customer check increased while the customer traffic count decreased. The average customer check initially increased in the first quarter as a result of increasing retail prices to partially offset provincial minimum wage increases. Management is closely monitoring consumer reaction to retail pricing strategies. In the Quarter, the Company declared shareholder dividends of $5.3 million, or $0.2139 per Share, which is unchanged from the prior year comparable quarter. The payout ratio was 102% for the Quarter and was 101% in the comparative quarter last year. For the nine month period, the Company declared shareholder dividends of $15.8 million, or $0.6417 per Share, which is unchanged from the prior year comparable period. The payout ratio was 106% for the first nine months and was 102% in the prior year comparable period. The Company’s working capital reserve is $4.2 million at September 30, 2018. The reserve is available to stabilize dividends in the event of short- to medium-term variability in System Sales and, thus, the Company’s royalty income. The Company does not have capital expenditure requirements or employees. The reserve has decreased $895,000 since December 31, 2017. Historically, the Company’s fourth quarter operational results have added cash to the reserve. The year-to-date decrease in the reserve is attributable to the reported negative SSSG, as well as a 2017 true-up payment to Pizza Pizza Limited of $111,000 made as part of the January 1 Adjustment Date in the first quarter. With this reserve in place, the Company will continue to target an annual payout ratio at or near 100% on an annualized basis. Fully-diluted basic EPS decreased 1.4% to $0.213 for the Quarter and decreased 1.9% to $0.632 for the nine month period, compared to the prior year periods. EPS decreased, as compared to 2017, due to a decrease in royalty income and an increase in PPL’s Equivalent Shares on the January 1, 2018 Adjustment Date. As compared to basic EPS, the Company considers “adjusted” EPS to be a more meaningful indicator of the Company’s operating performance and, therefore, presents fully-diluted, adjusted EPS. Adjusted EPS for the Quarter decreased 0.4% to $0.222 when compared to the same period in 2017, and decreased 1.7% for the nine month period. Current income tax expense for the Quarter and nine month period was relatively consistent with the 2017 comparable periods at $1.4 million and $4.2 million, respectively. Of particular note is that the Company’s earnings from operations before income taxes, calculated under International Financial Reporting Standards (“IFRS”), can differ significantly from its taxable income, largely due to the tax amortization of the Pizza Pizza and Pizza 73 Rights and Marks. The amount of the tax amortization deducted is based on a declining basis and will decrease annually. The number of restaurants in the Company’s Royalty Pool increased by seven locations to 758 on the January 1, 2018 Adjustment Date. The number of restaurants in the Royalty Pool will remain unchanged through December 31, 2018. During the Quarter, Pizza Pizza Limited (“PPL”) opened its first Pizza Pizza traditional restaurant in Vancouver with two additional restaurants to follow later in the year. Pizza Pizza opened four non-traditional locations, in addition to opening one Pizza 73 traditional restaurant. Two traditional and seven non-traditional Pizza Pizza restaurants were closed during the Quarter. During the nine month period, PPL opened 19 restaurants. By brand, Pizza Pizza opened five traditional and nine non-traditional restaurants; two traditional and nine non-traditional restaurants closed. Pizza 73 opened three traditional and two non-traditional restaurants; one non-traditional restaurant closed. Readers should note that the number of restaurants added to the Royalty Pool each year may differ from the number of restaurant openings and closings reported by PPL on an annual basis as the periods for which they are reported differ slightly. The following table sets out selected financial information and other data of the Company and should be read in conjunction with the consolidated financial statements of the Company. Readers should note that the 2018 results are not directly comparable to the 2017 results because of the fact that there are 758 restaurants in the 2018 Royalty Pool compared to 751 restaurants in the 2017 Royalty Pool. (1) The number restaurants for which the Pizza Pizza Royalty Limited Partnership earns a royalty (“Royalty Pool”), as defined in the amended and restated Pizza Pizza license and royalty agreement (the “Pizza Pizza License and Royalty Agreement”) and the amended and restated Pizza 73 license and royalty agreement (the “Pizza 73 License and Royalty Agreement”) (together, the “License and Royalty Agreements”). For the 2018 fiscal period, the Royalty Pool includes 652 Pizza Pizza restaurants and 106 Pizza 73 restaurants. The number of restaurants added to the Royalty Pool each year may differ from the number of restaurant openings and closings reported by PPL on an annual basis as the periods for which they are reported differ slightly. (2) SSSG means the change in period gross sales of Pizza Pizza and Pizza 73 restaurants as compared to sales in the previous period, where the restaurants have been open at least 13 months. Additionally, for a Pizza 73 restaurant whose restaurant territory was adjusted due to an additional restaurant, the sales used to derive the Step-Out Payment may be added to sales to arrive at SSSG. SSSG does not have any standardized meaning under IFRS. Therefore, these figures may not be comparable to similar figures presented by other companies. See “Reconciliation of Non-IFRS Measures” in Management’s Discussion & Analysis (“MD&A”). (3) The Company, indirectly through the Partnership, incurs interest expense on the $47 million outstanding bank loan. Interest expense also includes amortization of loan fees and off-market swap payments. See “Interest Expense” in the Company’s MD&A. (4) Represents the distribution to PPL from the Partnership on Class B and Class D Units of the Partnership. The Class B and D Units are exchangeable into common shares of the Company (“Shares”) based on the value of the Class B Exchange Multiplier and the Class D Exchange Multiplier at the time of exchange as defined in the Licence and Royalty Agreements, respectively, and represent 22.3% of the fully diluted Shares at June 30, 2018 (December 31, 2017 – 21.1%). During the quarter ended March 31, 2018, as a result of the final calculation of the equivalent Class B and Class D Share entitlements related to the January 1, 2017 Adjustment to the Royalty Pool, PPL was paid a distribution on additional equivalent Shares as if such Shares were outstanding as of January 1, 2017. Included in the three months ended March 31, 2018, is the payment of $111 in distributions to PPL pursuant to the true-up calculation (March 31, 2017 – PPL was paid $8). (5) “Adjusted earnings from operations”, “Adjusted earnings available for shareholder dividends”, “Adjusted earnings per Share”, “Payout Ratio”, and “Working Capital” do not have any standardized meaning under IFRS. Therefore, these figures may not be comparable to similar figures presented by other companies. See “Reconciliation of Non-IFRS Measures” in the Company’s MD&A. 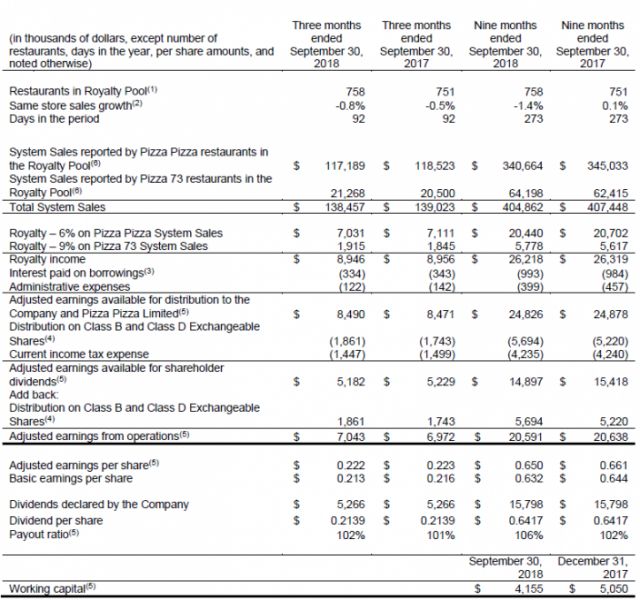 (6) System Sales (as defined in the Licence and Royalty Agreements) reported by Pizza Pizza and Pizza 73 restaurants include the gross sales of Pizza Pizza company-owned, jointly-controlled and franchised restaurants, excluding sales and goods and service tax or similar amounts levied by any governmental or administrative authority. System Sales do not represent the consolidated operating results of the Company but are used to calculate the royalties payable to the Partnership as presented above. A copy of the Company’s interim condensed consolidated financial statements and related MD&A will be available at www.sedar.com and www.pizzapizza.ca after the market closes on November 6, 2018. 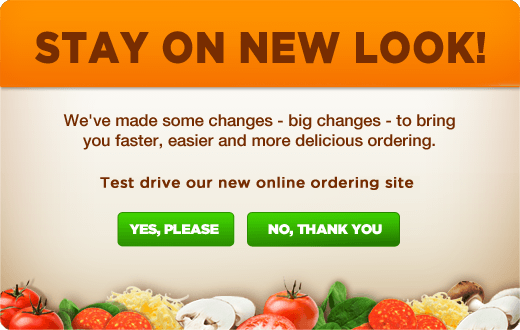 A recording of the call will also be available on the Company’s website at www.pizzapizza.ca. Certain statements in this report may constitute “forward-looking” statements which involve known and unknown risks, uncertainties and other factors which may cause the actual results, performance or achievements to be materially different from any future results, performance or achievements expressed or implied by such forward looking statements. When used in this report, such statements include such words as “may”, “will”, “expect”, “believe”, “plan”, and other similar terminology. These statements reflect management’s current expectations regarding future events and speak only as of the date of this report. These forward-looking statements involve a number of risks and uncertainties, including those described in the Company’s annual information form. The Company assumes no obligation to update these forward looking statements, except as required by applicable securities laws. Adjusted earnings and adjusted EPS are not recognized measures under International Financial Reporting Standards (“IFRS”) and may be calculated in a manner that differs from that used by other issuers. For additional information about the calculation and use of these measures, please see “Reconciliation of Non-IFRS Measures” in the Company’s Management’s Discussion & Analysis (“MD&A”).